4GB 4096-bit high-bandwidth memory (HBM) for higher bandwidth performance and less power consumption. 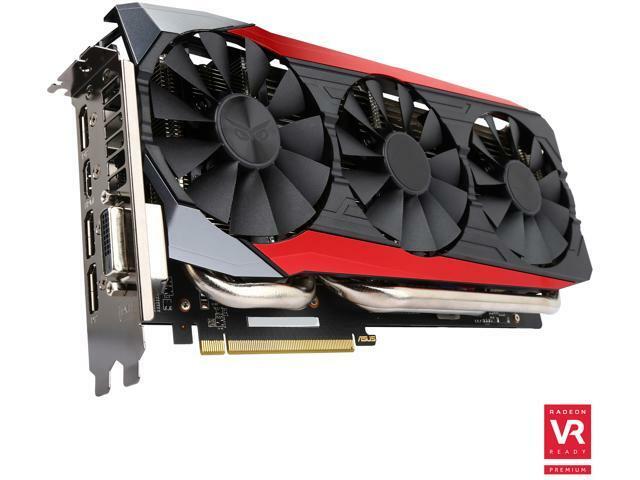 Super Alloy Power II: Aerospace-grade alloy components reinforce overall graphics card reliability while greatly enhancing efficiency, reducing power loss, decreasing noise, and lowering thermal levels. AUTO-EXTREME technology: Industry-first, 100% automated production process that incorporates premium materials to set a new standard of graphics card quality, performance, and longevity. TRIPLE THE FRAME RATE IN DIABLO III compared to a Titan Z from August 2015 at 4K. Other Thoughts: I can't wait to upgrade to AMD's latest GFX card. Need the money! Pros: The card is very powerful. I am very happy. I am coming from an R9 390 using a 3440x1440 monitor and the 390 was starting to get a little long in the tooth and sluggish in gaming. At that resolution it was just out of its element. I got this R9 Fury and am very satisfied so far. It is also very quiet, if you put the fans on 100% manual it does produce some noise but I have not seen the fans go over 55% yet and I have gamed with the latest games on ultra settings for 4+ hours. The card has a solid build quality and is pretty heavy. There is also a DVI port which most Fiji boards do not have I have been told. But I don't use it. Cons: The weight of the card, it is starting to sag in the PCI-E slot, not much but enough to make me start thinking about it. It uses 2 PCI-E 8 plug connectors, The card stays surprising cool and the fans stay very low rpm but I can definitely tell its using a lot of power, my aging but awesome PSU, a PC P and C Silencer 950 Mark II starts to blow warm air for the first time since I have had it when this thing is under heavy load for extended periods of time, BUT the GPU manages to dissipate the heat very well. Also tends to not OC very well compared to other GPUs, but that is relative. Pros: Does the job, I'm a first time builder and have not had issues with the card. I game daily and don't crash while playing? so idk, i won the ASUS lottery. Other Thoughts: I would buy the card again. Cons: Freezes, Black screens, coil whine, you name it, this card probably has it. Other Thoughts: Overall I can not recommend this card to anyone. The instability issues are too much to handle. I wish I could have put my money into a different card. Pros: Hard to come up with Pros; the card is not stable. Cons: I replaced a Radeon 7950 with this card and the action made an otherwise very stable machine become unreliable and frustrating. It crashes the machine often, as evidenced by assessing the windows event log and technical introspection/troubleshooting of the machine itself. Bottom line: adding this card to my machine = my machine no worky. Other Thoughts: I would definitely not recommend this product to anyone. Cons: Crashes my system (Black screen of death) quite consistently. I chose this card for a new build with high expectations based on performance reviews. Pros: Looks cool. That's it. Cons: As MANY have said. Black screens, giving my MG279Q issues, and software is not good. It worked for about 3 weeks. I have narrowed it down to the card which was BRAND NEW 01/05/16. Replaces EVERY COMPONENT in my PC and made several posts on tech forums about my issues. It was not my Motherboard, CPU, RAM, heatsink, PSU, Case, Fans, Monitor, Windows, SSDs, razer headset/mouse, Thermal paste, or Steelseries keyboard. EVERY. SINGLE. COMPONENT. Was replaced in the last 9 weeks. I had so much faith in a brand new 569.99 card. Now I want it out and gone. The motherboard and CPU were the last pieces I changed which I did on Sunday 03/16 and played WoW for 20 minutes and black screen. Not even a full reboot. It just goes off with everything running still! Other Thoughts: I only buy ASUS. I like the products. This is the first thing I bought that gave me such grief. I gave up two Strix 970s for this cause I wanted to try FreeSync.... I was a fool. Pros: Runs cool and fast....when it works. Cons: Constant black screens of death. Sent in for RMA and card was deemed working as advertised. Updated bios and still getting issues. Did a complete OS reinstall to no avail. Previous posters have said there is an issue with the bios where it downclocks. Terrible customer service. Hung up on 3 times when attempting to obtain an invoice stating there was nothing wrong with my card. Other Thoughts: Replaced with a 970 due to the fear I would lose work with a black screen of death. No issues with the 970 so it is 100% pinpointed to the card itself. It appears the Sapphire R9 Furies are working as intended, and Asus should recall these cards since they are faulty.